Time to sell your Grand Beach Resort condo? Read about today's resort market buyer. 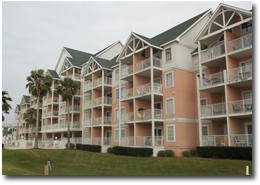 Grand Beach Resort condominium is located in Eastern Gulf Shores on the north side of Beach Boulevard. The complex consists of 78 individual condo units built in 1998 by one of the area's more reputable developers. The condos are not directly on the Gulf of Mexico, but offer unspoiled views of the Gulf and sit across from state-owned land. Grand Beach Resort is withing walking distance of Lake Shelby and the Gulf Shores State Park. Many of the condos in Grand Beach Resort have a great feature utilizing the hallway as a bunk area which accommodated a couple of extra spots for guests. The condominium consists of one-, two-, and three-bedroom condos ranging in size from 650 square feet to 1,080 square feet. If you would like further info for Grand Beach Resort or any other property in the area, please email info@condoinvestment.com or by calling 251-Area-Pro (251-273-2776) for immediate assistance. View RENTAL TIPS on how to increase Grand Beach Resort rental revenue. Click here for annual rental income info for Grand Beach Resort and all other Gulf Shores condos.